13. Nike Dunk Low Pro SB "Heineken"
Heineken wasn’t exactly down with the unofficial collabo, requesting eBay users pull their name from the listings on these. 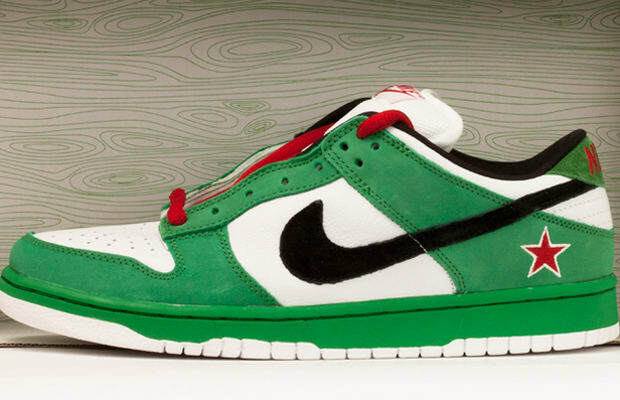 Officially endorsed or not (the star on the heel was that added touch that meant so much), the name still reigns supreme in the sneaker culture as one of the illest SB Dunk drops of all-time. Need a pair? We do too — only seven Benjamins to stunt on Instagram. Pour out a little Heineken beer.